Marble is one of the most admired materials for art and architecture. Formed from calcite or dolomite crystals that are subjected to extreme heat and pressure in the interior of the Earth, this brilliant white stone is used in some of the world's most beautiful sculptures, buildings and furniture. Marble was historically mined by the ancient Greeks and continues to be mined from quarries today, all over the world. Once mining has begun, there may be several months of digging before any marble is extracted from the quarry. Overburden, or dirt on top of the desirable ore, needs to be extracted before blocks of marble can be removed. In addition, establishing roads or tunnels for vehicle access is critical to the profitability and efficiency of the mine. 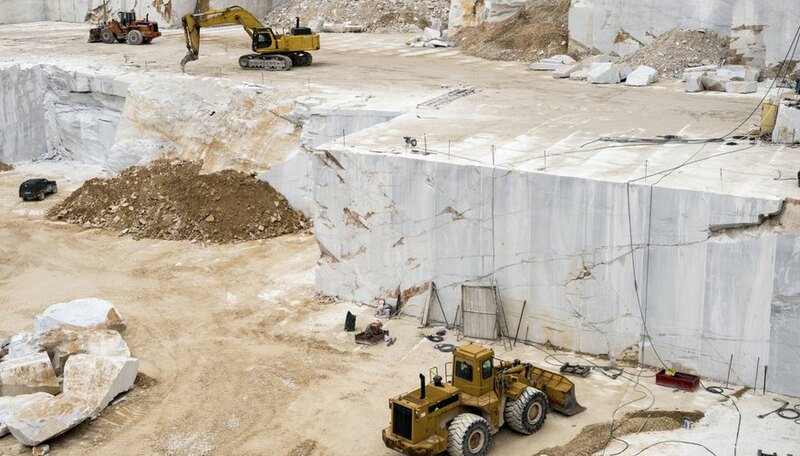 A quarry manager needs to oversee each cut made from the quarry; marble mined along the "vein" of the deposit will have a very different look than marble that is "cross-cut" across the vein. Mining marble blocks from the wall of the quarry starts with a "bench wall." The bench wall is a large section of marble along a vertical wall that is cut with diamond cables, drills, and torches. Dynamite loosens the bench wall from the side of the quarry, and the separated wall can then be processed and cut into individual, uniform blocks. A marble block usually weighs between 15,000 and 25,000 pounds. After the blocks are extracted from the quarry, they'll go through further processing to match their intended purpose. For tiles, the marble is cut into stone billets and polished to a smooth sheen. Marble slabs for construction or sculpture are cut using diamond wires or a gang saw, which uses multiple diamond-tipped blades to slice a marble block into more manageable slabs. Often, a resin is applied to fill in cracks in the marble's surface. After polishing, only 1 percent of the surface will be coated in resin, maintaining the purity and beauty of the finished stone. Roman, Max. "How Does Marble Get Mined From a Quarry?" Sciencing, https://sciencing.com/marble-mined-quarry-4567716.html. 24 April 2017.